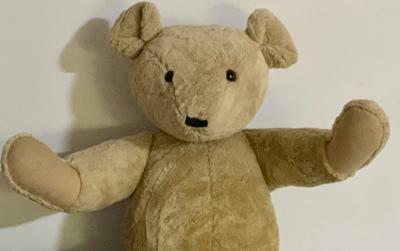 I was given this beautiful 90.2 cm - 3 f tall antique/vintage bear with circular moving arms and legs plus his head moves to he has gorgeous brown eyes and padded hands and feet but there are no other markings or tags that I can find on him could you please help me find out what make of bear he is thank you. Plus I have no idea what his origin is either. A friend gave him to me as she was down sizing she was given the bear as payment for an Avon order of over $400.00 a few years ago. I would appreciate any help or information regarding my beautiful bear please.